Deep in the cradle of civilization, something more was brewing than mans’ intention of conquering the known world. Women were brewing their own ideas but these ideas would not disappear with the sand. These ideas were born of yeast, grains, dates and honey. These ideas became beer and it was a woman’s world. To get us rolling, we start in Sumeria in what is now modern day Iran, circa 1800 B.C. Cultural centralization was happening for the first time- in the world –and humans were beginning to wonder what went best with their mutton burgers. 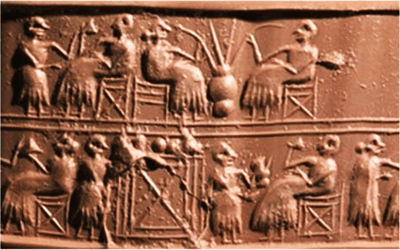 Ancient Sumerians are depicted drinking beers. Women were giving birth to beer and beer became the midwife of civilization. 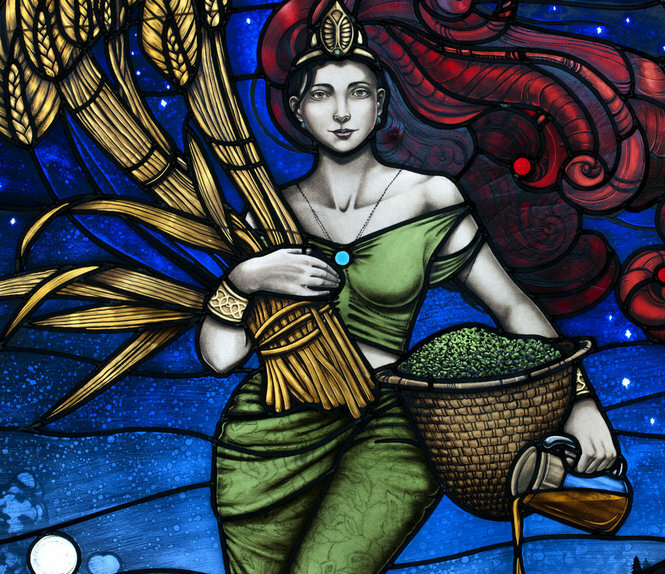 In honor and reverence of such a creation, the Sumerians attributed Ninkasi, daughter to the goddess of procreation, with the title “goddess of beer”. Coincidence? Maybe. Little else is known about Ninkasi other than an anonymous hymn dedicated to her. The Hymn of Ninkasi describes her as the creator of what becomes known as beer and is given credit as it’s master. Ninkasi, and the women of Sumeria, made such a significant impact on the world that beer drinkers continue to enjoy variations of this concoction to the present day. 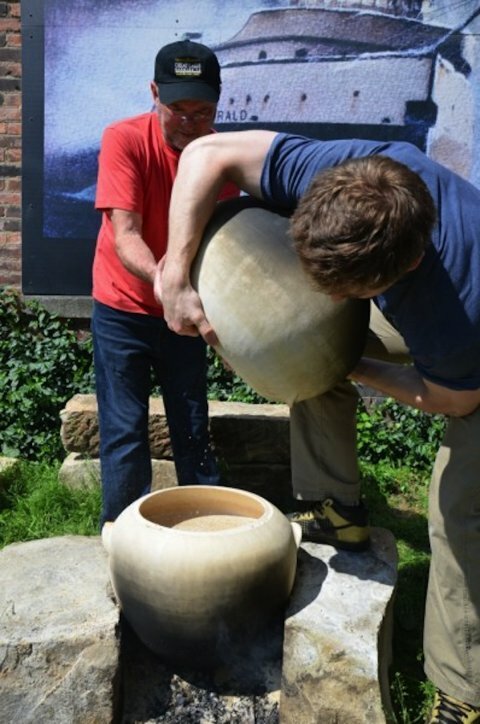 Brewers at Great Lakes Brewing using Sumerian style clay pots. Photo (c) Great Lakes Brewing Company. These variations and renewed Sumerian recipes can be tasted through such craft beer as Dogfish Head’s Ta Henket, Great Lakes Brewing Co.’s Sumerian Brew or Anchor Brewing Co.’s Sumerian Brew Experiment (Ninkasi Brew). Dogfish’s Ta Henket is likely the only “original recipe” available on the open market. While Ninkasi may be the first reference to beer in the world (and female at that), there are many goddesses from cultures around the world that express just how important beer and beer-like beverages were to daily living. Accla from the Incan culture is said to be “the keeper of fires” who also brewed beer. There is some debate on whether Accla was a goddess or merely a general title given to virgins whom served the sun god but there is an understanding of higher social status in any case. Another goddess associated with beer is Albina, White Barley Goddess of Argos. Albina may be one of the most popular namesakes for beer. Giratempopub in Italy, uses her name for a beer and it is also believed that the early name of the British Isles (Albion). It is also the name for the first microbrewery in the U.S. (New Albion Brewing). Ragutiene, found in Lithuanian mythology, was one of three gods said to be responsible for beer life. Ragutiene was the female caught in a brewing triangle with two male companions one being the god of fermentation, Raugupatis, and the other being the god of beer, Ragutis. An annual feast is held in their honor where beer lovers can enjoy the splendors of the Autumn and sample the local fermentations.